To call a production by The Frisch Marionette Company a puppet show would be like calling the Indy 500 “some cars driving.” Not too many puppeteers have found themselves featured on Showtime and in People magazine. Frisch has been featured in both. In terms of staging, lighting, artistry, and originality, Frisch transcends the usual, and ventures into the extraordinary, mesmerizing children and adults alike with their productions. Doubters need only visit the Testimonials section of the Frisch website, where words and phrases like, “enthralling”, “…best school performance I have seen in my 21 years of teaching,” “Wonderful! Wonderful! Wonderful!,” and “The children were spellbound” are the norm. This type of entertainment is rare. This quality of entertainment is even rarer. The Frisch Marionette Company began as all good things do, with a thought, a dream and a committed passion to making that dream real. We could say that the beginning of the Frisch Marionettte Company goes all the way back to a childhood puppet show whose impression never ended. That would be true, but it was much later, after many years meandering through the arts that Kevin Frisch rediscovered the beauty, the challenge and satisfaction of puppetry. By 1986 Kevin had moved to New York City and joined Nicolas Coppola and The Puppetworks of Brooklyn. Working with the many talented puppeteers at the Puppetworks, Kevin developed his own art, craft and skills as a puppeteer and artist. The next nine years were spent touring the New York Metropolitan area as well as performing in The Puppetworks permanent theatres in Brooklyn and Macy’s Herald Square. 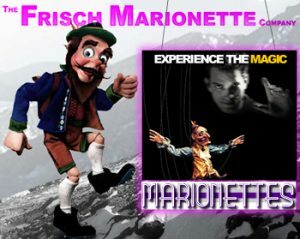 In 1995 Kevin moved back to Cincinnati to begin what is today The Frisch Marionette Company. Working with a talented team of puppeteers and artists, Kevin has established The Frisch Marionettes as an exceptional entertainment and educational experience for children and adults alike. Working primarily with marionettes, The Frisch Marionette Company performs in the traditional styles of 19th Century European Puppetry. Drawing inspiration from the great European troupes such as the Salzburg Marionette Theatre, we endeavor to bring one of the great old world arts to young, contemporary imaginations. Every aspect of a Frisch Marionette production is designed, handcrafted, created and recorded in our own workshops. Each and every puppet is hand-carved, every costume is sewn and custom tailored for each character. We take great pride in our craft, but we’re even more proud of the excited, twinkling eyes of wonder that surround us at the end of each performance. 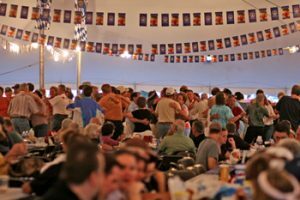 With polka music legends like Fred Ziwich, Joe Wendel, and Hank Haller in the house, every year the Cleveland Oktoberfest dance floors fill up with polka dancers. Heck, there’s even a style of polka named after our fair city. But what if you don’t know how to polka? Would the Cleveland Oktoberfest let you just sit there with your pretzel looking sad? No, we would not. That’s why we’ll be offering FREE polka lessons in our Educational Building to anyone who wants to learn. Now we know that the cool-conscious teens and twenty-somethings among you may think the polka dated. Well, you’re right. It’s not the latest craze, and you won’t see Spring Breakers dancing the polka on MTV’s Grind, but like baseball and apple streudel, the polka is a classic. It is timeless, romantic, and moreover, as Clevelanders, it’s a part of our heritage (and one well worth preserving). In the end, dancing is just a way to express joy, and you can never learn too many ways to do that. Besides, equipped with your new polka moves, you might just impress that special someone. Your guide as you embark on your polka odyssey will be Casey Karbowski. Casey Karbowski learned to polka dance by going to “learn to polka dance” night at a Cleveland polka bar called the Brookstate Inn. He is a member of the Cleveland Polka Association, where he also teaches polka dance lessons. He travels the country dancing the polka and specializes in polka dancing. He loves to polka dance and works to keep polka dancing a vibrant and popular art form. He also promotes polka dancing through his website clevelandpolka.com. He invites you to come to the polka dance lesson and hopes that you also can learn to love to dance the polka. Exhibit featuring photo montages of Euclid Beach Park will be on display in the Educational Building Saturday, Sunday and Monday. Euclid Beach Park Now, a 501(c)(3) nonprofit group, will be hosting the display. 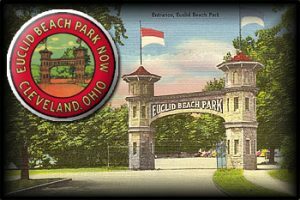 Along with the picture collages of scenes from the Park which operated from 1895 to 1969 on the shores of Lake Erie in Cleveland’s Collinwood neighborhood, Euclid Beach related merchandise ranging from books, T-shirts, pictures, videos, and audio CD’s will be available for sale. Please stop by to discuss your favorite Euclid Beach memories with our Board Members and consider membership in our group which includes quarterly newsletters. When you visit our display area, make sure to pick up some information about the upcoming celebration on September 30th on the grounds where the Park operated and the Euclid Beach Park Grand Carousel which has been fully restored and operates daily at the Western Reserve Historical Society’s History Center in University Circle. For more information about our upcoming events and the Carousel visit our website: www.euclidbeach.org . On Sunday and Monday, an audio-visual presentation featuring two DVD’s produced by Russell-Kelleher will be shown. Members of LEAKOIL (Lake Erie Kombi Owners Involvement League) will pull a van or two into the educational building and share information on the pedigree of the vans. The fact that so many VW buses are still running is a testament to impeccable quality of German engineering. It is also a testament to the VW bus’ place in American history that so many are so dedicated to keeping these wonders of the road in working order. They are mobile time capsules that drive us back to one of the most turbulent, yet also one of the most creative, eras our country’s history. Some may have parts held on with duct tape, or gaskets sealed with bubblegum, but still they run—and when all’s said and done, they’re just plain fun. …Like the vans they drive, their owners tend to be pretty colorful too. LEAKOIL is a group dedicated to promoting and maintaining air-cooled VWs. The members own a wide variety of bay, split-window and vanagons, and will be camping at the Oktoberfest in the area of the car show. Camping is restricted to LEAKOIL members. Information on the VW Campout, and on obtaining membership in LEAKOIL, can be found on this page. Fill out the form below to receive exclusive news, updates, and chances to win prizes!